What this image is, we don't know. 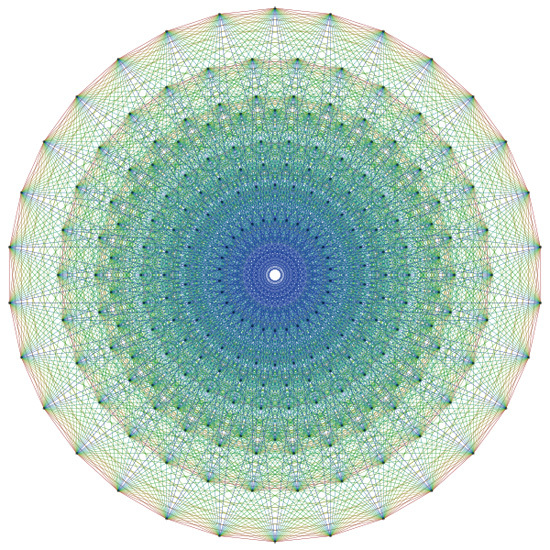 That is, we know what the labels say, that it is a graphical map of E8, “one of the largest and most complicated structures in mathematics,” but our minds instantaneously turn into primordial ooze trying to comprehended even a single aspect of it. Nevertheless, it's perfect as a paving pattern, perhaps the centerpiece of a new urban plaza. Some will be lulled by its supremely logical order and resolved geometry, serenity in complexity. Just as likely will many be empathetically pulled in and then violently ejected by its swirling patterns, while those unfortunate enough to reach the center will be gravitationally pulled down, like James Stewart taking a Hitchcockian plunge into the cinematic canvas. Or like Michelangelo's Campidoglio in its determination to affect the movement and experience of the user. Everyone will try to make sense of it, even consult Wikipedia; but realizing that it is of absolutely no help, they will inevitably stop trying to understand it. And then a future Dan Brown will come along. Possessed by madness and in hermeneutics overdrive, he will decipher this bit of the built environment. In his mediocre but megablockbuster book, he'll explain to everyone that it was designed by a rogue sect of Opus Dei, illustrating the supradimensional family tree of Jesus and his demi-god offsprings. It's the all-seeing-eye of the Divine. Screw the plaza. Let's make it a street plan and coordinate building heights according to color zones. It could be the blueprint for the next megalopolis, built from scratch. A crystalline, mathematically perfect Dubai. E8 as the Burnham Plan 2.0, if you will. Tear Chicago down and build this in its place, out over the lake. Hang gardens from the rooftops and turn it into a green mountain, an urban hive. Urbs Sub Horto. But even then, the CTA trains would experience regular 20 minute delays. By Jove! you've cracked the formula! Is it only me that thinks "peacocks" when looking at this?